After leaving Melbourne we headed off on the M31 Hume Highway, heading towards Sydney. Before leaving the Mornington Peninsula it had been suggested that since we were going to be in Australia for a while the we should apply for a medicare card this is because the UK and Australia have a reciprocal agreement on medical care. This came in very handy when my poor husband had a little medical issue, we called into hospital in Seymour where he was seen, operated on and out within 30 mins and all free of charge! We stopped at a couple of places on route including one town where we were advised to turn our car around to face the way of the traffic otherwise it could be a $200 fine… we did so pretty quickly. We stayed overnight in Albury and our motel owner was a fellow Britt who had left the UK over 30 years ago. He recommended a few places to us and we had dinner that night in a local pub where the steak special was $15 per person! After a quick breakfast, we headed off back on to the M31 Hume Highway for what was to be the longest part of our journey. I had done some washing which we were drying on the parcel shelf of the car! We often followed some of the tourist routes so that we really saw some of the places we were driving past and we decided to stop at a lovely small town called Yass where we had a picnic lunch by the river; there are so many picnic places to pull over all over Australia and we were making full use of them. We had booked our next two nights accommodation, our first was the other side of Sydney just outside of Newcastle at Cardiff Heights, whilst the next night we had chosen to stay at Nambucca Heads which had been recommended to us by a lady we had met on the tram in Melbourne. The journey was very easy and traffic was good until we got a bit closer to Sydney. We stopped at a Drivers Rest area Deerubbun Reserve where the pelicans were competing with the local fisherman for their catch. We called into Woolworths (very much like our M&S foodhall or waitrose) and picked up a cooked chicken and some salad for our dinner before we arrived at our apartment in Cardiff Heights. We didn’t have so far to travel today so we leisurely got ourselves ready for the journey by making a picnic lunch before we left. The journey was beautiful with tree lined roads and lots of lakes. As we were driving we came across Andy’s Cherry Pie Cafe, so of course we had to stop and have a cup of tea and some cherry pie for breakfast. We stopped off at Port Macquarie where we ate our picnic lunch overlooking the ocean and the surfers. There is a lot to see and do at Port Macquarie and I feel that we could have spent a couple of days there, its renowned for its scenic river cruises, Pacific Ocean, golden beaches, lush rainforests and abundant wildlife as well as impressive convict built buildings to ancient Aboriginal land. We arrived at Numbucca Heads late afternoon so we wasted no time in heading off to explore before the sun went down. The V Walk is just stunning and very emotional as you read the messages that have been painted on the rocks. We called into one of the local bars where we had a schooner of beer and oysters as apparently they are the best in the area before heading back to our accommodation. We left Nambucca Heads and headed off to Coffs Harbour along the coastal road stopping to take photos. Its also the home of the Big Banana which is Australia’s original and iconic ‘Big Thing’ and now has a brand new 4D Ride Simulator, featuring four of the latest and best ride simulator films in the world as well as the biggest Giant Slide in the Country. We stopped by the river in Ulmarra for our picnic lunch were there were about 10 water dragons watching us as well as a tree full of fruit bats. 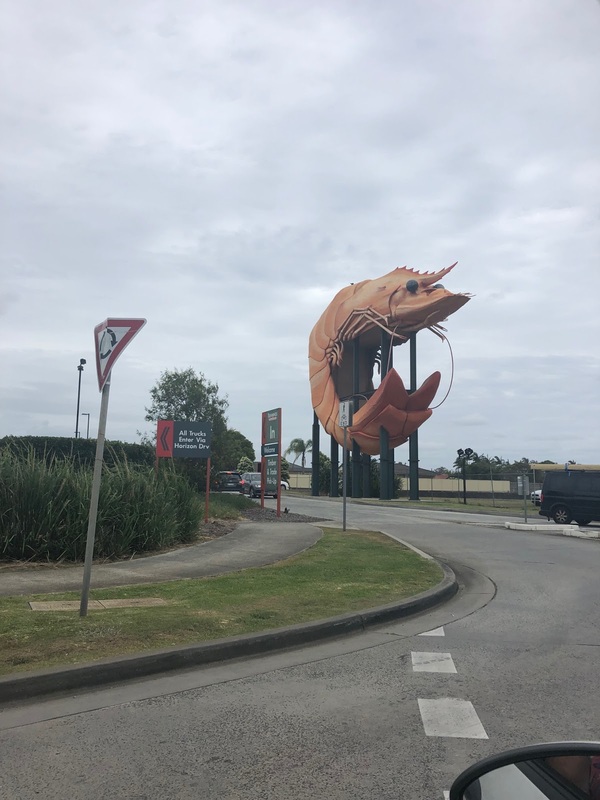 We also drove past a giant prawn in Ballina! The Big Prawn was built in 1989 and is another of Australia’s iconic big things. We then headed towards Byron Bay which is a place for hip and trendy people and Surfers Paradise before arriving at our destination just outside of Brisbane in Rochedale South where my cousin lives and which would be our base for a while… but that’s the next story.